For Spring Summer -17, Global Sports Brand PUMA introduces its latest collaboration with renowned kid's fashion brand, tinycottons. 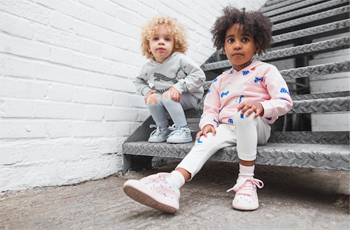 Announcing the partnership in style, PUMA has teamed up with the designers at tinycottons to create a capsule collection as part of the brand's SS17 -Tribute' range. Featuring classic PUMA silhouettes refreshed with tinycottons' playful attitude, the collaboration is turning playgrounds into runways with on point tiny looks. Founded in Barcelona in 2012 and successfully presented its first collection only one year later, tinycottons quickly found a central place in the kids fashion scene due to its clean designs, unique graphic language, and above all, lighthearted attitude. The -Tribute' range takes it inspiration from the design explosion in Paris in the 1970s which Creative Director Barb Bruno remembers fondly. The collection features a range of graphic prints, which are a subtle and lighthearted tribute to the artsy city and the characters and animals that roam in its streets. The PUMA x tinycottons capsule rejuvenates PUMA's iconic footwear and apparel silhouettes for Spring Summer, combined with the -Tribute' collections' seasonal fresh, elevated graphic executions. The capsule heroes the classic court silhouette, the PUMA Basket, offered as leather and canvas executions and available in both infant and pre-school sizes. The Basket Leather is available in three fresh spring colours, Illusion Blue, Peach Nougat and Pink Dogwood, while the Basket Canvas features a mono-coloured canvas upper with a bold all-over application of two -Tribute' collection prints. The capsule collection also features apparel, including the PUMA Classic Logo Tee and Classic Hoody, both of which have been treated with the tinycottons -Tribute' graphic identity. Speaking about the new collection, PUMA's General Manager for Sportstyle, Reinhard Dischner commented: 'The Kids category has grown significantly for PUMA. This fun collaborative collection features classic PUMA silhouettes and pairing that with tinycotton's unique playful graphic language sets it apart and makes it very premium. It's a match made in the playground." The PUMA x tinycottons capsule collection will be available in the tinycottons store in Barcelona and PUMA stores, tinycottons.com and PUMA.com, and select kid's stores globally.